Jesus was always full of surprises. His ministry and preaching were often paradoxical. The Son of the living God was born in a borrowed stable and laid in in a bed of straw rather than in a modern hospital where he could be guaranteed the best medical attention. His foster father was a humble carpenter, not a lawyer, a prince or a college professor. His teachings on marriage shocked the crowds. His invitation to love our enemies sent people away confused and doubtful. He went to the houses of tax collectors and sinners and dined with them. Jesus' mercy was similarly paradoxical, as illustrated in his choice of disciples. Take Matthew for example. Matthew had to really wonder, on more than one occasion, why Jesus called him to follow him and be one of the Twelve. Did Jesus know that Matthew, deep in his heart, had wanted a change in his life? 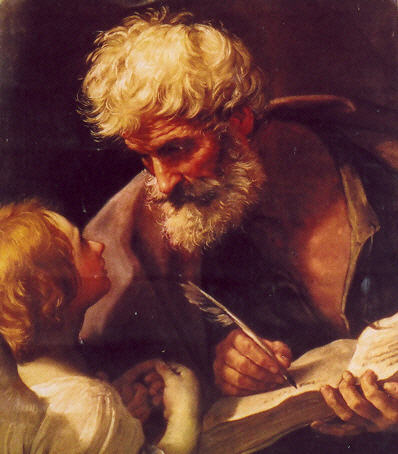 Or did our Lord simply look into the depths of Matthew's soul, beyond the surface of Matthew's profession as a tax collector and his sinfulness, and see Matthew's potential to be a man of great faith and holiness, an apostle and a Gospel writer? Whatever was on Jesus' mind, He chose a man detested by many Jews to become a pillar of his Church and an author of the Good News. When people were surprised by Jesus' actions or teaching, it was because they could not see in the first place why He came to dwell among us. His mission was to save sinners and restore their union with his Father. He came to forgive us and love us back to health because He was the Divine Physician. "Those who are well do not need a physician, but the sick do . . . I did not come to call the righteous but sinners." I am always amazed when I read the lives of the saints at how painfully aware they were of their own sinfulness. St. Teresa of Lisieux, St. Teresa of Avila, St. Francis of Assisi and St. Augustine come to my mind in particular. As holy as they were, as important as they were to the Church, and as great as their accomplishments were, they all saw themselves strikingly in need of God's tender mercy. St. Augustine writes in his Confessions, "Woe is me! Lord, have mercy on me! My evil sorrows and good joys are at war with one another. I know not where victory lies. Woe is me! Lord, have mercy! Woe me! I make no effort to conceal my wounds. Your are my physician, I your patient. Your are merciful; I stand in need of your mercy." Lord Jesus, plant in our hearts a true desire to be a saint. Let it begin with an honest awareness of how each of us stands before you, as a sick person before the Doctor, as a sinner before the Divine Physician. May we be totally surprised with the depth of your love for us, the speed with which you offer your forgiveness, and the power which flows from your healing touch. May gratitude so well up in our hearts that we are compelled by the Spirit to proclaim for you from the mountaintops, "I desire mercy, not sacrifice."